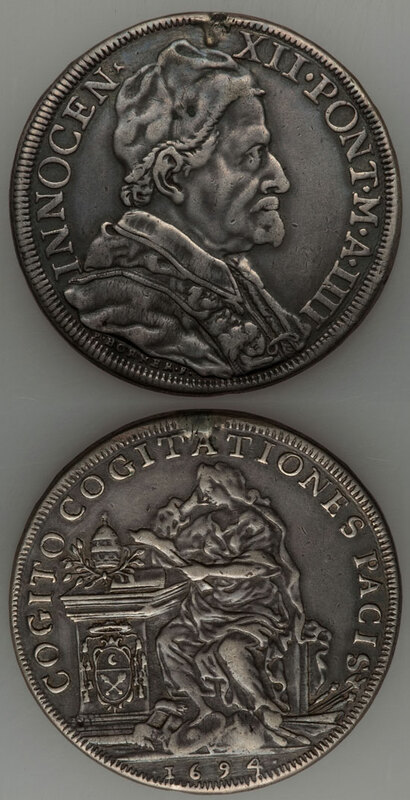 Papal States 1694 piastra, Anno IV of Pope Innocent XII (1691-1700). On the reverse, female figure of Religion seated with feet on weapons and banners; her elbow placed on an altar where lie tiara, palm branch and a book. On the side of the altar, the coat-of-arms of Monsignor Farsetti. Around, COGITO COGITATIONES PACIS, I Think Thoughts of Peace. This boldly symbolic design recalls Innocent's efforts to promote peace between France and the Grand Alliance. VF, mount removed, KM#576, Berman#2224. Rare. By engraver and medallist Peter Paul Borner.